Warm and sunny this early evening Tuesday on California’s north coast — we continue our good-weather phase, with some high temperatures forecast for the end of this week. The T-Rump ain’t got walkin’-round-sense. Yet he’s actually walking around representing us — the shits. 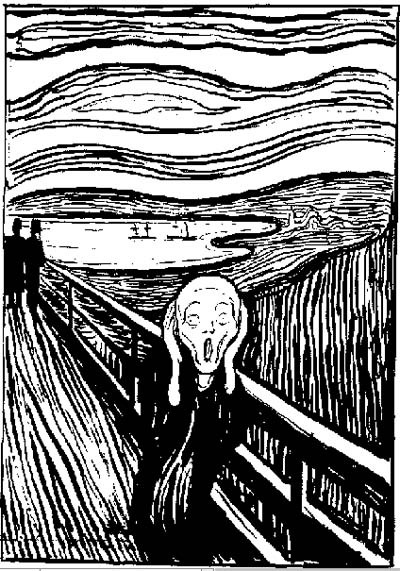 (Illustration: Edvard Munch‘s ‘The Scream,’ lithograph version, found here). But barely 24 hours after his wife, Melania, appeared to refuse to accept his palm as the pair arrived in Israel, Mr Trump was on the end of the First Lady’s rejection once again. Video of the couple landing in Rome and stepping out of Air Force, seemed to show Mr Trump reaching for his wife’s hand, and her moving her hand away. The apparent snub came a day after a similar scene at Ben Gurion International Airport in Israel, where Israeli Prime Minister Benjamin Netanyahu and his wife, Sara, rolled out the red carpet for the US leader. On that occasion, Mrs Trump seemed to swat away her husband’s hand with a flick of her wrist. “Well this is embarrassing,” the Israeli publication Haaretz wrote on its Twitter account. Director of National Intelligence Dan Coats on Tuesday refused to address — but did not deny — reports that President Donald Trump asked him to push back against allegations the Trump campaign colluded with Russia, while a former CIA chief testified he was aware of “interactions” between the campaign and Moscow. At the same time Coats was testifying, former CIA Director John Brennan appeared before the House Intelligence Committee and said he believes Russia “brazenly” interfered in last year’s presidential election and that he knew of contacts between Trump associates and Russian officials. “I encountered and am aware of information and intelligence that revealed contacts and interactions between Russian officials and U.S. persons involved in the Trump campaign,” Brennan told lawmakers. He added that he is not sure whether “collusion existed” between the campaign and Moscow, but the interactions were enough that he believed the matter warranted an FBI investigation. “It raised questions in my mind about whether Russia was able to gain the cooperation of those individuals,” Brennan said. The comments came one day after lawyers for Trump’s former National Security Adviser Michael Flynn informed the Senate Intelligence Committee that he would not cooperate with a subpoena for records of communications related to Russia. Flynn misled White House officials, including Vice President Mike Pence, about his conversations with Russia’s ambassador to the United States after Trump’s election victory, which led to his dismissal.